Jonathan Veira is a lot more than an opera singer as audiences of his one-man show will testify. Read below one review of his show, An Audience With Jonathan Veira, and you will see what you have missed so far. But you need not miss out completely, you may be interested in seeing him perform in your town at some time in the future. If so, why not drop him an e-mail and he will let you know the information you need with a view to putting on a show. Go to the contact page to send an enquiry email. In a Christian context Jonathan shares his faith in a natural, non-threatening way, concentrating on the centrality of God in his life. This makes it ideal as a low-key evangelistic event, where Christians can bring along their friends, confident that the entertainment is both top quality and with a clear message about faith. Know of any professional opera singer who can ably crossover to a full evening of popular music and chat while fully retaining his or her credibility? Such are the talents of 48-year-old operatic bass baritone Jonathan Veira, who has performed in innumerable grand opera houses across the globe (he can sing in seven languages! ), in an equally impressive variety of guises, and to considerable acclaim. 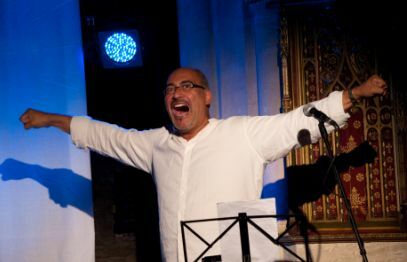 Nearer to home, he is a regular guest on Songs Of Praise and on BBC Radio, and while wearing his "contemporary" hat, he regularly performs shows at Bible weeks like Spring Harvest and Detling, and in churches across the land. Billed An Audience With Jonathan Veira, the singer proved to be thoroughly adept on keyboard and guitar and sounded completely at home in a range of styles and sounds; from Louis Armstrong ("What A Wonderful World") to Billy Joel, to Gershwin, to Eric Bibb ("Want Jesus To Walk With Me"). He's also known to do an impressive Van Morrison, Bob Dylan and even Coldplay! But it doesn't stop there. In-between each song, indeed taking up as much as half of his two-hour set, this Guildford-based husband/father quickly won the hearts of his audience with his convivial, down-to-earth personality. Totally relaxed, he delighted to recount unlikely anecdotes from his personal life, mixing them with such a constant stream of wit and humour that I really felt this guy could earn a living as a full time stand-up comedian. An able mimic - he did a great Elton John impersonation! - he was at his funniest when singing not-so-clever song titles of infamous country and western tunes. And he followed it up by sounding like a natural Nashville country singer on his take of Don William's "You're My Best Friend". It was only in this second half of the show, and even then fairly subtly, that Veira declared his personal Christian faith. It was, it seems, a deliberately low-key evangelistic event; his main purpose in doing these shows, he claimed, was to make people laugh. And laugh we certainly did. It was a delightful, all-round evening's entertainment; my only regret being that the singer included virtually no opera pieces - just a few delightful momentary flourishes when most of us would have loved to have heard so much more. It would be good to hear this outstandingly gifted entertainer bring both the classical and the contemporary repertoires together in what would surely be an even more remarkable show. Praise as opera singer jacks up his act! Performers who attempt the difficult crossover from classical to popular music can run the risk of alienating both sets of fans, who then often cite financial, rather than artistic motives for such a switch. And when it's an otherwise well-established and successful opera singer presenting his one man show, not surprisingly there will be even more raised eyebrows! Of course, this is not to reckon with the immense and varied talents of Jonathan Veira, singer and pianist, who kept a packed audience absolutely spellbound for over 2 hours with a fascinating mix of humour, anecdote and, of course, superb music. There was Gershwin, A Donizetti aria, a Billy Joel number, gospel, country & western, blues, standards like 'Mona Lisa', 'My Funny Valentine' and much more besides, a veritable pot pourri which, on paper, would have seemed totally ill-suited in juxtaposition. However, whilst Jonathan is a true Jack-of-all-trades, he is an unsurpassed master of them all, subtly changing his delivery rom one genre to the next, allowing the programme to unfold seamlessly, yet still maintaining an almost impromptu feel to the whole show. 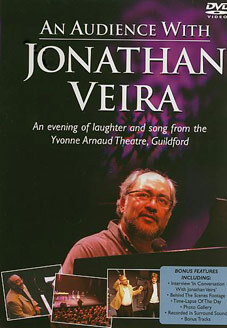 Jonathan Veira is not only blessed with a quite superb voice and keyboard skills to die for, but it is with his endearing sincerity and demeanour that he is consumately able to win over everyone who is fortunate enough to have been granted an audience with such an eminently likeable, amusing and thoroughly entertaining artist. Jonathan Veira is the best one-man show I have ever seen, and no, I'm not one of his relatives! He can sing and play anything from opera to Billy Joel, and he dos a great send-up of both County AND Western music. A naturally funny guy. If you go to this guy's show and you don't enjoy yourself - you need to see your doctor, there is DEFINITELY something wrong with you ! It was with great excitement and anticipation that Carole and I came to your concert at Kirby Muxloe. We had seen your video and purchased your CD's and decided we must see your live show - this was the nearest venue, 50 miles from our home in Derbyshire. We brought two friends from our church with us and we were not disappointed. We were treated to a great and memorable evening. Just wanted to say loved the show at Spring Harvest this year and I am looking forward to seeing J.V. on May 2nd when he comes to Locks Heath. It will be a full house and everyone is so looking forward to it. If anyone who is reading this who has never seen the one man show, please please try and go. It says on the main webpage that it is like going to see a friend, and that is exactly it, you cannot help but like (love) him and care for him. Thank you Jonathan and Sue for a fantastic show at Ferndown. I was invited by a friend and was not expecting much but was pleasantly surprised and found it refreshingly unreligious. Hi Jonathan, I just wanted to tell you how much Kim (my wife) and I enjoyed this evening. We found your singing to be a truly moving experience, along with your musical talent / gift. And your humour appealed to mine, which is often described as 'out there'. Thank you for your professionalism too, it was a privilege to be able to serve you. Notwithstanding Jonathan's obvious musical talent, he has an ability to reach out and connect with his audience in a unique and sensitive way so that everyone in the room seems to be totally enthralled and captivated. Don't miss an opportunity to be part of one of these very special evenings, because that is what it feels like - you are part of it. It will certainly be an evening I don't forget in a hurry! Have just returned home after enjoying your tonic of a performance. I was invited to join a friend as her guest and had little idea what I was in for! THANK YOU for reminding me how to laugh. I booked my ticket for the "Audience" in Bedford recently and then thought my expectations were too high and I would be disappointed. How wrong could I have been - it was like stepping back in time and I found my spirits raised as they used to be back in Guildford. In addition to your many talents you still have the gift of making people feel special and I thank you for a wonderful evening. We thoroughly enjoyed your concert at Gorsley on Saturday, in fact my husband had tears running down his face. We took 2 friends who wrote to thank me today; Jackie said that her husband was so inspired by you that he resolved to - at this point I got really excited & expected to see on the next line that he was going to go to church or do an Alpha course, but no, he is going to get their piano restored & learn to play ! a nice selection of stills put to one of Jonathan's tracks - All that matters.